There were 705 press releases posted in the last 24 hours and 153,600 in the last 365 days. A collaboration between Oregon Health & Science University and the Department of Energy's Pacific Northwest National Laboratory has been chosen as a national center for a Nobel Prize-winning method of imaging that is revolutionizing structural biology. The new Pacific Northwest Center for Cryo-EM is one of three national centers established by the National Institutes of Health with a $128 million federal investment in cryo-electron microscopy, or cryo-EM. The others are located at the New York Structural Biology Center in Manhattan and at Stanford University. The NIH is putting an additional $1.5 million toward training users about the technology. The centers are designed to boost access to an important and rapidly developing imaging technology that lets scientists see molecules with striking clarity. Using cryo-EM, scientists can see the individual atoms in a molecule or protein and can witness how networks of molecules are organized in fine detail. That's valuable to researchers in all sorts of ways, from designing a molecule that could slow a disease process to creating new compounds to speed or slow chemical reactions. The technology is based on electron microscopy, which works similarly to ordinary microscopy, except that a beam of electrons is sent through the sample instead of visible light. Because electrons have a much shorter wavelength than visible light, they can resolve molecular structures at an atomic scale. Cryo-EM is an approach used by scientists to freeze a sample in solution so rapidly that the surrounding water does not crystallize but rather forms a thin glass-like layer. This cryogenic sample is then imaged with the electron beam to reveal details of its near-native structure. 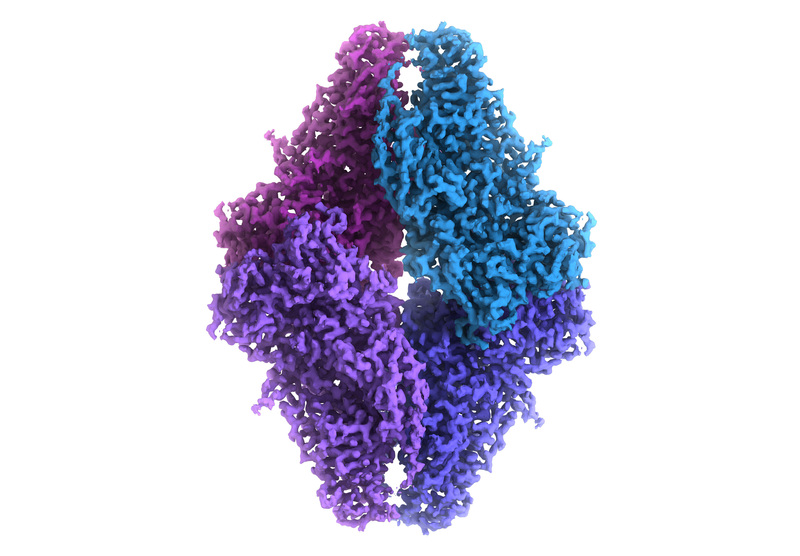 A steady stream of improvements has vastly enhanced the images from cryo-EM; just last year three researchers earned the Nobel Prize in Chemistry for their work that set the foundation for recent developments. "There's been this enormous revolution. It's like the analogy of going from film cameras to digital," said Eric Gouaux, principal investigator of the new center, a senior scientist in the OHSU Vollum Institute and an investigator with the Howard Hughes Medical Institute. The NIH centers will give more scientists around the nation better access to the technology. Thousands of scientists have projects that would benefit from cryo-EM, but high costs, scarce expertise and other factors limit their access to the technology. The centers will make the technology available to scientists around the nation to collect high-resolution data while also providing outreach and training. Overall costs to the users will be limited to the cost of shipping a sample or travel to/from the center. The costs for operating and maintaining the instruments is covered by the new funding. This improved level of cryo-EM access will ultimately make a difference in the lives of patients who will benefit from biomedical research that happens more rapidly and results in more accurate findings. The OHSU-PNNL collaboration was a strong factor in the creation of the center, according to senior research scientist James Evans of PNNL, another principal investigator of the project. OHSU is an outstanding biomedical research institution with a long history of successful NIH-funded scientific research. PNNL has more than two decades of experience running EMSL, the Environmental Molecular Sciences Laboratory, a DOE Office of Science user facility used by hundreds of scientists worldwide. EMSL is home to more than 50 premier instruments coupled to supercomputing, data analytics, and storage capabilities that are used by researchers to investigate questions about biological systems, the environment, energy, and other areas. EMSL is also a hub of expertise for operating the instruments and interpreting the data that results. "Merging the existing strengths and expertise at both institutions allows us to create a unique center and user experience streamlined for high-resolution structural analysis of isolated macromolecules and intact cells," said Evans. The new cryo-EM center is part of a burgeoning collaboration between OHSU, in Portland, Ore. and PNNL, 225 miles to the east, upstream along the Columbia River. Recently the institutions announced a collaboration to advance precision medicine. Earlier this decade PNNL and OHSU created joint research centers devoted to cancer, undiagnosed diseases, and the development and application of new technologies for biomedical research. The new center will add four powerful microscopes to OHSU's campus and will be jointly staffed by scientists from OHSU and PNNL. The center will be co-located with the existing Multiscale Microscopy Core, which is used extensively by the cancer research lab of Joe Gray, professor of biomedical engineering in the OHSU School of Medicine. The team expects the new center to be up and running late this year. The center will draw on the high-performance computing, data analytics, and storage capabilities at PNNL. Data gathered through the instruments at OHSU will be streamed to PNNL. At the lab, EMSL's powerful Cascade supercomputer will construct initial 3-D images of the molecules under study, and those images along with the raw data will be made available to researchers. Part of the new funding will go to increasing Cascade's capacity and efficiency at processing the cryo-EM images. "Ten years ago, you would have seen the general areas where the proteins were as blobs on a screen. Now we're able to see the atoms within those blobs," said Michael Chapman, professor of biochemistry and molecular biology in the OHSU School of Medicine and another principal investigator. This work is supported by funding from the National Institutes of Health's Common Fund, through the Transformative High Resolution Cryo-Electron Microscopy Program, and administered by the National Institute of General Medical Sciences under Award Number U24GM129547.